Do you like the look of old books? Fan of that Lewis Carroll-penned classic, Alice in Wonderland? 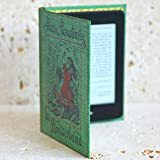 If you’ve answered yes to both questions, then you’ll find KleverCase’s Alice in Wonderland case a must-buy for your Kindle Paperwhite. The cover itself feels like an old hardbound book, complete with “vintage” endpaper and an interior book plate. In fact, one wouldn’t even suspect that there’s a Kindle inside. This is great if you want to secure your Kindle discreetly (i.e. perfect when you’re on the train, bus, or any other form of public transportation). But unlike old books, this KleverCase cover is splash proof and very durable too. The first thing you’ll notice about the Kandouren case cover is its very vivid print- a copy of a painting by Vincent van Gogh- right on the front. It’s an understated, yet extremely elegant piece of art, one that even the most stubborn of philistines is sure to enjoy. Then you’ll notice its lightness; for such an extremely sturdy case, it doesn’t feel as hefty as you would expect. The cover is made out of an anti-skid, wear-resistant material, so it can handle a bit of rough and tumble here and there. It can perfectly protect your Kindle from light bumps and splashes so that you can rest knowing that your device is safe wherever you go. Sleek, minimalistic, and elegant- the HAOCOO Ultra Slim Leather smart case is all of these and more. 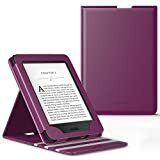 This case does away with the usual loud and campy covers that other Kindle Paperwhite cases have, and instead replaces it with a sleek faux leather design that comes in a whole range of colors. There’s a smart on/off function, which means that you can wake or put your device to sleep just by opening/closing the cover. No need to press buttons on your Kindle- just simply close the cover and your device will take care of itself. The Newshine Case exudes both beauty and utility. First, the cover itself has a very cool aesthetically-pleasing design. It’s also made out of premium faux leather, which makes it soft to touch, yet sturdy enough to withstand light bumps and pressure. As an added bonus, the case is designed to be use for a long time. The surface repels dirt; it’s also sweat and water resistant. This is the perfect case for people who love to spend hours reading and poring over their Kindles. Tired of all those bulky Kindle Paperwhite covers? Then the Moko Case Ultra Lightweight Shell cover is something that you might be interested in. When they say it’s “ultra slim” they really do mean it. This is probably one of the thinnest and lightest Kindle Paperwhite covers that is available on the market today. But don’t let it’s thinness fool you. It can still provide the needed protection and support that your Kindle Paperwhite needs. The cover has a microfiber interior so that your device will be protected from scratches no matter how many times you use your Kindle in a day. 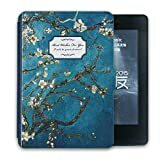 The MoKo Case Vertical Flip cover has all the qualities of a high end Kindle Paperwhite case (those that are in the $50 and above price range), at half the price. The case has just the right amount of bulk to provide the protection that your Kindle needs. It also has a soft leather interior that adds another degree of protective coverage to your device and to also avoid scratches of any sort on the screen. Sleek and sharp, this MoKo Kindle case oozes style and class just with its looks alone. 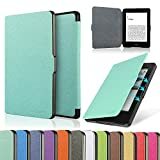 There are no fancy designs and loud colors here- the premium PU leather cover is plain subdued black, which sets it apart from most of the overly-designed Kindle cases that are on the market today. 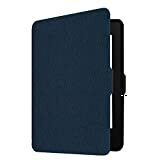 As with all MoKo products, this case has a no-scratch microfiber interior, a magnetic closure, and an auto on/off function that allows you to turn your Kindle on or off just by opening or closing the lid. 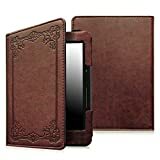 The Fosmon Anti-Glare (Matte) Case doesn’t only protect your Kindle from daily wear and tear, it also makes it easier and more comfortable for you to hold- as if you’re holding a real book.The faux leather has an intricate design on the front, and overall, gives a very handsome and classy look that you can rarely find on any other Kindle cases. 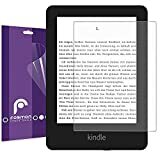 It has a magnetic closure, an auto-wake function, and a Velcro fastener which (along with an inside flap that wraps around your device) ensures that your Kindle stays put no matter what position you use it in. Simple, classy and subdued. If you want a no non-sense Kindle Paperwhite case, then the Fintie SmartShell might just be the right case for you. At first glance, the durability of this product is apparent. The back shell is made out of a sturdy polycarbonate material, so that you can be sure that your Kindle will be protected from nasty bumps. The Fintie SmartShell can also be folded back on itself, so that you can easily carry and read your Kindle with just one hand. 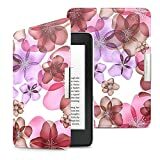 Of course, if you want the best Kindle Paperwhite covers, then buy them directly from the Kindle manufacturers themselves. The official Amazon Kindle Paperwhite Leather Case is a thing of beauty. From its textured natural leather cover, to its form fitting interior, everything about this product screams quality and excellent craftsmanship. It’s an absolute must-buy for any Kindle Paperwhite owner out there who wants to get the most out of their device.